Summer weather has definitely arrived in northern California. We are having nice sunny days, mostly mild, but sometimes with temperatures reaching up to 100 degrees. 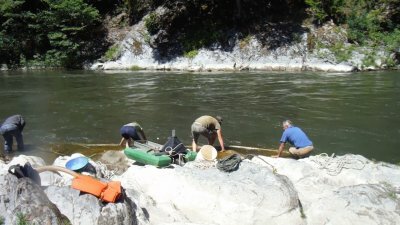 Lots of enthusiastic members have arrived and are prospecting along the very extensive mining properties which we manage on the Klamath River and its tributaries in northern California. Our first potluck at the Happy Camp Grange several nights ago was a full house with so much enthusiasm that I’m surprised we did not blow the roof off the building! There were plenty of enjoyable moments and incredible food. John Mc Hugh from Louisiana went so far as to air-freight in enough fresh crawfish to fill a very large steamer. That’s something I believe we have only enjoyed one other time during the past 31 years! Many members are prospecting without the use of motors this season to avoid being hassled by State officials. As discussed in previous newsletters, and the next section of this newsletter below, California passed a new law which went into effect this year. Changing the definition of a “suction dredge,” the new law forbids the use of any mechanical device to support gold prospecting within 100 yards of a waterway unless you first obtain a water quality and a suction dredging permit – neither which they are making available. In our view, the law violates basic American rights on multiple levels and will be overturned in the courts — perhaps even in the Rinehart decision (see more below). We also do not believe prospectors will be successfully prosecuted for using the very same types of mechanical devices that are being allowed to anyone else who is not prospecting for gold. In this light, some members are just moving ahead with traditional motorized prospecting systems; and with our support, fully prepared to mount a legal challenge with the State of California if they are hassled. Since our weekend Group Mining Projects are the very first gold mining experience for many who attend, often with their children, we naturally want to avoid any hassles with the authorities during these projects. Said another way, let’s allow our attorneys and more aggressive members to challenge unreasonable rules and regulations while the rest of us continue to enjoy the freedoms that remain available to us. 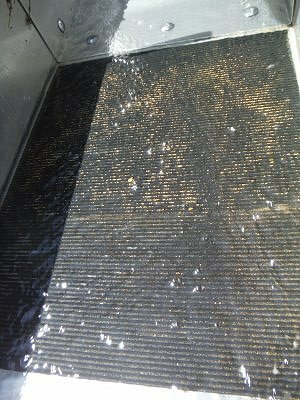 It is with this in mind that we began a while back experimenting with ideas on how to generate a water flow through a gold recovery system without the use of a motorized pump. Historical American miners worked this all out during the early days before motors were readily available. But to a large degree, those technologies have been lost or forgotten by the modern world. So we are in the process of working it all out again. And not just us; we have a bunch of members working out non-motorized systems, using gravity and water in combination to create both pressure and suction systems. This is easier to accomplish on the side streams where the water drops more dramatically than most places along the Klamath River. Since we do our weekend projects along proven high-grade portions of the Klamath River, our options, as we know them, are not as easy. The first idea we came up with was to capture water some distance upstream of a substantial set of rapids in the river, and then direct that captured water through a hose down to our recovery system. After looking this over more closely, we calculated that it was going to require quite a long section of hose or pipe to provide the volume and pressure needed to operate a recovery system some distance away from the river. We know this will work. But we decided to try a few other options first. Our second idea was to capture water in a section of river where the water is moving more swiftly, hoping that the increased pressure of the higher-velocity flow of the river would provide an adequate feed to our recovery system. We did accomplish some success with this using an initial prototype; but with the first outing fast-approaching, we ultimately tabled this idea and switched gears to another idea that we were certain would work. The main lesson we learned in our first attempt is that water force against a capture device does not necessarily produce volume and pressure through a hose. From our first try, we decided that a more gradual size reduction of the capture device would likely produce the result we are looking for. The river is hugely powerful. Certainly there is a way to capture a portion of that energy and convert it into the water flow we need to operate a small recovery system. Our next attempt will be with a sea anchor as the capture device. Here follows a video segment that captured several of us on our first attempt to force water flow through a hose. We do have members making use of sudden drops in both the river rapids and side tributaries to create underwater suction systems both upstream and downstream of the drops. This is rather easy to do. It’s more challenging to use the force of the river to supply water to a recovery system up above the river. Ultimately, to make sure we had something in place for the first weekend project of the season; we captured water some distance above the river and ran it through several reducing hose sizes to produce plenty of pressure and volume on our very popular K-23AA property. This is located around nine miles downstream of Happy Camp. Several guys on our crew said they have encountered good sampling results in that location. This was a good place to do the project, because there is a very large road-side pull-off that allows plenty of room to park cars, and for members to camp if they choose to. The office arranged to have an outhouse delivered there. So we were all set for the weekend. There were 84 people signed up for our first project. By our count, 70 members arrived on Saturday, and 60 were out there with us on Sunday. Sometimes the heat on Saturday afternoon persuades a few to not come back out on Sunday. This is unfortunate, because we start early on Sunday morning and are usually off the river before the heat of the day sets in. Sunday is when most of the exciting action takes place. Saturday on these events is split between some theory in the morning on how to find gold, along with some entertaining gold stories which I tell in the coolness of the Happy Camp Grange Hall. Then we do a few hours of gold pan-sampling out along the river during the afternoon. This was a very enthusiastic bunch of members. 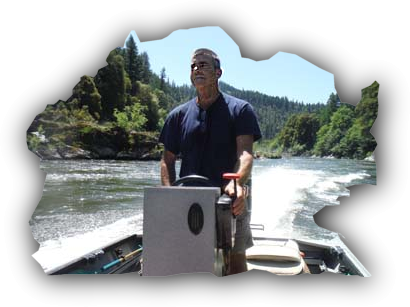 We used one of our large rubber rafts to ferry them across the Klamath River to the project site. The object on Saturday afternoon is to teach beginners how to pan for gold, and to confirm the existence of the gold deposit that we will work on the following day. Each person is allowed to keep any gold he or she finds on Saturday afternoon. Rafting rides add more fun adventure to these weekend projects! The problem on this Saturday afternoon was that the pan samples, more or less, were not producing the results we are accustomed to seeing on these projects. Oh my! This particular problem falls squarely on my shoulders since I am the one who measures out the splits on Sunday afternoon. It is the nature of prospecting that sometimes you don’t find much gold. Most participants insist that the learning and outdoor adventure is what’s most important to them. But I know deep in my gut that a good gold split is the way to send everyone off with a deep smile in their hearts. 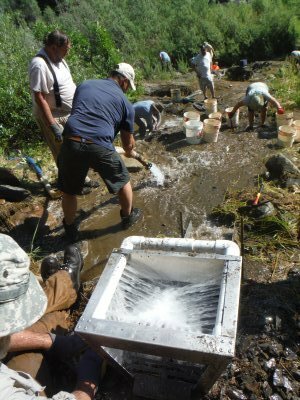 Fortunately, we had several veteran prospectors helping on this project. Craig Colt turned up some good samples in one place. Don Drimel found a good spot to dig and even found a small nugget. Laura Bagley and Scott Coleman found perhaps the best-producing area a short walk downstream of where we had set up the recovery systems. The water system for our recovery systems was already set up for this project. So we needed to just work harder to produce an acceptable amount of gold in that location. My project helpers and I made a plan to direct most of the digging on Sunday in those places where several good samples were produced on Saturday. One of the important lessons participants learn on these projects is that hard work by itself is not enough to produce gold. The hard work must be directed to the exact place where the gold has been hidden by Mother Nature. Using the water discharge from our first high-banker, we were able to suction mine pay-dirt into the second high-banker! Using gravity to our best advantage, we positioned one high-banker further up the hillside. The tailings water from there flowed down into a pool. 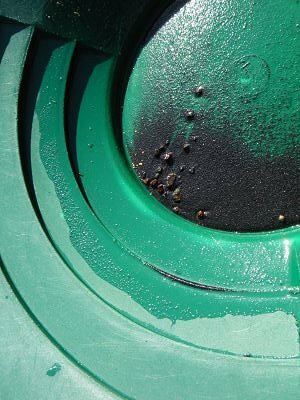 We used a nozzle to suction pay-dirt out of the pool, which was then gravity-fed into a second, larger high-banker. Natural contours on the river bar trapped all of our tailings water – which seeped into the ground and eventually returned back to the river entirely filtered clean. This is called “environmentally-friendly mining” and it is largely applauded by the environmental community. Very cool! A sample of just one part of the lower recovery system after two hours of digging demonstrated that we were recovering more gold than I was hoping for. Showing the gold around to everyone prompted them to work even harder. This wasn’t necessary, because they were already digging more pay-dirt than we had the capability to process. It turned out she was sitting right on top of virgin streambed! 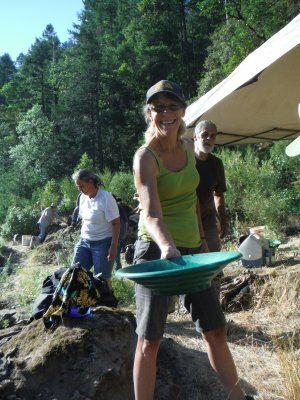 About an hour before we were going to close things down, LeeAnn Martin, who was using a spray of extra water to wash down some bedrock, forwarded her excavation right into a patch of original Klamath River streambed; hard-packed material that had never been processed before. This changed everything! 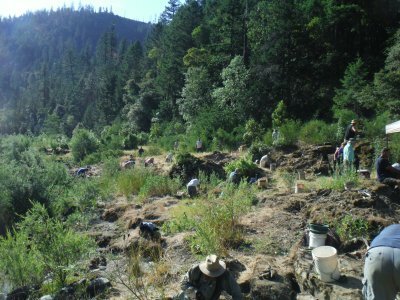 Original Klamath riverbed, wherever we find it, is usually very rich. Most often, it is located at the bottom of the river where it was more difficult for earlier generations of miners to reach. So we redoubled our efforts in the newly-discovered material for the remainder of our time out there on the river. The exciting thing about gold prospecting is that you never know what you might discover! We could see that fatigue was beginning to set in on some of our digging crew at 10:30 AM. So we asked everyone to stop digging pay-dirt and devote their remaining energy into filling holes and reclaiming the area. All our gear was disassembled and stored away while the two gold recovery teams redoubled their efforts to process a bunch of pay-dirt that had been piled up. 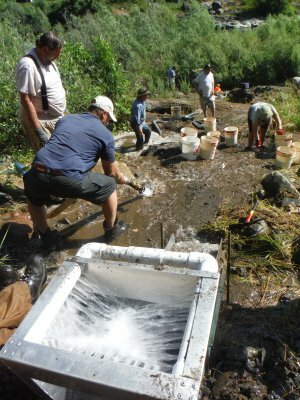 When we finally ran out of time, the remaining pay-dirt was shoveled into the excavation where we discovered virgin streambed. Somebody was certainly going to go back there and process that material – perhaps as soon as on Sunday afternoon! A great big wall is what we need to make America great again! We love everyone who doesn't hate us! After ferrying everyone to the road-side of the river, we met early on Sunday afternoon at the Grange Hall in town and finished our final clean-up and gold separation. We ended up with eleven pennyweights; about $700 in gold, which we split 60 ways. There were 10 nuggets. My experienced helpers and I were very pleased with the result, given that the samples from the day before were not producing the results we normally see. The project was finished at 3:30 PM – the earliest ever. Happy chatter and enthusiastic discussions in the Grange hall were almost deafening as we were passing out the gold splits. This makes it difficult to get the group’s attention when I am trying to demonstrate the final steps of gold separation. But through three full decades of doing these projects, this “happy noise” has become wonderful music to my ears. You guys worked so hard! Between now and our next weekend project, we will be experimenting with a Plan C idea on how to flow water through a gold recovery system that can be moved nearly anywhere on the river or side tributaries without having to gravity feed water from higher elevations. Stay tuned! Here is the full video version (with music) of our weekend project put together by Alan Mash. The California Supreme Court listened to oral arguments in the Rinehart case on the first of June, just a few weeks ago. As I have explained in earlier newsletters, the Rinehart case is perhaps the most important litigation concerning mining that has happened during our lifetimes. The question in front of the Court is to what extent the State has the authority to materially interfere with or prohibit different methods of mining on the public lands because of real or imagined environmental or social concerns. In this case, the controversy is over California’s refusal to issue any suction dredge permits, without even providing a process to consider if any impacts exist in the first place. Just as I was expecting, the justices appeared to be very familiar with the case. They played devil’s advocate with both attorneys, each who was allowed 30 minutes of time. Our attorney, James Buchal, who is representing Rinehart in this case, made a very passionate presentation on behalf of small-scale miners. More quietly, the State attorney argued that the federal mining law has nothing to do with commercial viability; and that as long as we are allowed to pan for gold on our mining claims, the State is not “prohibiting” mining. Unless someone is awfully lucky, it takes a lot of time, effort and risk of personal resources to locate a commercial mineral deposit. The U.S. Congress encourages us to pursue the activity by rewarding a property right and priority use of the surface resources when someone actually succeeds. According to my understanding of the federal mining law, the only thing that turned Rinehart’s mining claim into a property right in the first place was his discovery of a commercial deposit at the bottom of a waterway — which can only be effectively recovered with a suction dredge. Mineral recovery, by the way, is the primary building block of any economy. 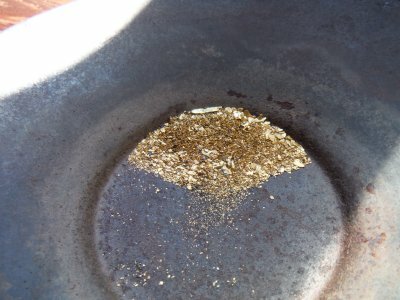 Starting a whole new prospecting activity with a gold pan is apples and oranges. Because his deposit at the bottom of the waterway is no longer accessible, Rinehart doesn’t have a valid mining claim anymore. It places Rinehart back at the starting point as if he never located a commercial deposit in the first place. It is a whole new contract: “If you can find a viable mineral deposit with a gold pan, we are going to allow you to profit from it with a gold pan.” Give me a break; what about the commercial deposit he already found? Does the State have the authority to void a preexisting contract between Rinehart and the U.S. Congress? Not if we live in a free country! Having devoted the past 40 years to the mining industry, there is one thing I know to be true: Commercial viability is the only thing the federal government considers when it is attempting to validate or invalidate a prospector’s claim to a mineral deposit on the public lands. If there is not a commercial discovery, which must also include a viable means to recover the minerals, the “mining claim” is void from the beginning. As a different example, if someone located a commercially-viable underground mineral deposit, and then the State passes a law that forbids miners from going underground, (1) the guy would not have a valid claim anymore, and (2) the State will have undermined Congress’ promise that the prospector would be able to profit from the underground mineral deposit that he worked so hard to discover. It’s one thing to have concerns about the environmental impacts of a project. It is another thing to ban a mining practice altogether, providing no process to see if there are any important impacts, or if there are none at all. Suction dredging has been studied so extensively, the documents would fill a warehouse. There is no evidence that a single fish has ever been harmed in any way as a result of the dredging regulations that California adopted in 1994. It is unnecessary to look beyond our situation to understand why America has lost its competitive edge in the world as every great nation in history has done. The State has decided that because of just the possibility of negative impacts, they will not allow the use of any suction dredges until every imaginable impact is fully resolved. This is a requirement that is entirely impossible. In my own view, and in that of a unanimous decision by the Third Appellate Court, this amounts to an unreasonable prohibition upon mining and should be preempted by federal law. So now we will wait and see how the California Supreme Court will weigh in. Nobody knows how long it will take for a written answer. Though it would seem reasonable that they would try to finish it up while the material remains fresh on their minds. The Court has a heavy case load. I’m hopeful that they would prefer to finish each case as soon as possible. All or most of the ongoing litigation over suction dredging in California State court is on hold until the California Supreme Court issues a decision on the Rinehart case. 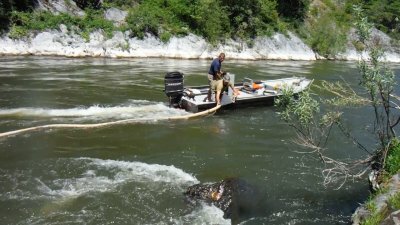 The New 49’er Legal Fund retained a specialty law firm in Sacramento a few months ago to evaluate the prospect of a federal challenge to California’s new water quality law (SB 637) which has redefined “suction dredging” to include any mechanized device used to excavate or process material for gold within one hundred yards of any waterway. These attorneys have now carefully studied all of the litigation we have been through during the past 7 years, along with the litigation concerning motorized mining in Oregon. Their best advice is for us to wait until the California Supreme Court weighs in on Rinehart before deciding what to do next. They believe it is likely the Court will issue guidance in their decision that will set a clear direction for the future. If the direction is in our favor, I can see how things will roll back in our direction rather quickly. If the direction is against us, our next and final stop will be with the U.S. Supreme Court. Our attorneys believe the Supreme Court will take up this case because of the national implications. Win or lose, we are likely headed towards the U.S. Supreme Court! Here is an explanation which I provided to members at our potluck several days ago. Which way the U.S. Supreme Court is likely to lean will be strongly influenced by who wins the White House this November. We do live in interesting times! Once again, I want to acknowledge and thank all of you for supporting our efforts to preserve small-scale mining in America. If it were not for you guys, we would have been swept away a long time ago. Let’s not give up. The battle for freedom is not over! 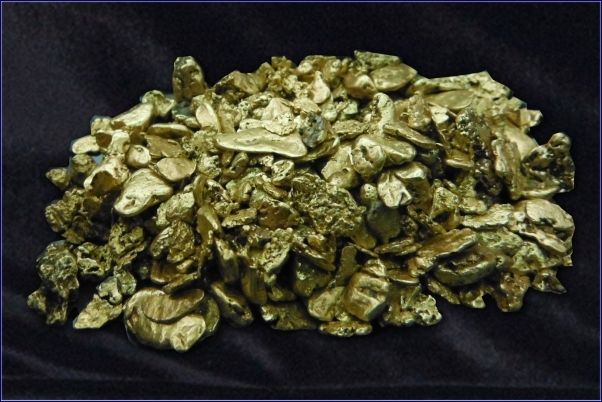 Three Ounces of Klamath River Gold Nuggets! To encourage your support in replenishing The New 49’ers Legal Defense Fund, The New 49’ers are allowing three ounces of Klamath River gold nuggets to be split into 25 prizes in this fund-raiser! The drawing will take place during our Saturday evening potluck in Happy Camp on 25 June 2016. That’s just 2 weeks away! All weekend events are free to Full & Associate Members! This season, at least until the legal question about using motors is resolved; we will be demonstrating how to recover volume-amounts of gold using non-mechanized methods of mining. Believe me when I say that there still remain viable methods of recovering Mother Nature’s golden treasure! You might be really surprised! With all the people who participate in our weekend projects, my guess is that the gold production will not change by much. All participants will receive an equal share of the gold we recover. The New 49’ers provide all of the sluicing equipment and boats used in these projects. You will need to have your own basic digging tools, gold pan (available in the prospecting shop in Happy Camp) and transportation. You will also need to provide your own lodging and nourishment. Group projects are limited to a manageable number of participants. Scheduling in advance is strongly advised to ensure a position on any specific weekend project: 530 493-2012.